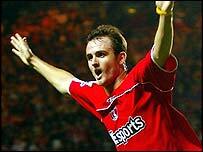 Francis Jeffers scored twice on his Charlton debut as Alan Curbishley's side cruised to victory over Villa. Early on Darius Vassell hit the bar for Villa, but just before the half-hour Jeffers rose superbly to head home Hermann Hreidarsson's cross. Five minutes later Jeffers capitalised on a blunder by Villa skipper Olof Mellberg to sweep in Charlton's second. After the break Luke Young pounced on a Thomas Hitzlsperger deflection and proceeded to finish with some aplomb. Having lost 4-1 to Bolton on the opening day of the season, Charlton have now secured back-to-back victories at The Valley. Villa will wonder just how the game slipped away from them, particularly after making such a promising start. Vassell should have put Villa ahead in the sixth minute but he could only sidefoot the ball against the crossbar following a Gareth Barry cross. Having survived that scare, Charlton regrouped and they had a reasonable appeal for a penalty after Nolberto Solano appeared to catch Dennis Rommedahl's heel. Charlton did not have to wait long to make the breakthrough though, as Hreidarsson's deep 29th-minute centre was headed in by Jeffers. A Mellberg mistake then allowed Charlton to extend their lead. The Swede was unable to deal with Radostin Kishishev long pass and Jeffers, lurking on Mellberg's shoulder, pounced on the Villa defender's mistake to guide a volley past Thomas Sorensen. Soon after Villa's Danish goalkeeper had to rush out to save at the feet of Kevin Lisbie, an act of bravery that left Sorensen writhing in agony and saw him replaced by Stefan Postma for the second half. On 58 minutes Rommedahl's chipped pass deflected off Hitzlsperger and straight into the path of Young. The former Spurs defender produced a fine finish into the corner to net his first goal for Charlton. Charlton: Kiely, Young, Fish, Fortune, Hreidarsson, Rommedahl (Hughes 82), Kishishev (El Karkouri 78), Euell, Murphy, Lisbie, Jeffers (Konchesky 75). Goals: Jeffers 29, 34, Young 58. Aston Villa: Sorensen (Postma 45), Delaney, Mellberg, Laursen, Samuel, Solano, McCann, Hitzlsperger, Barry, Vassell, Cole (Angel 72). Subs Not Used: De la Cruz, Whittingham, Moore.